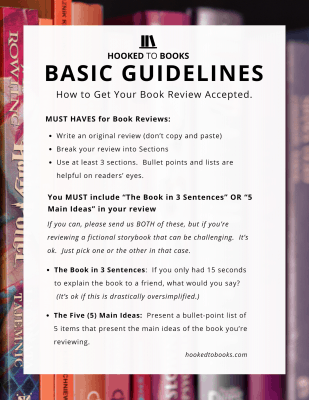 You’ve landed on the Hooked to Books page specifically crafted to help you submit a Book Review. You may have directly found this page, or come over from our Write for Us page. Or if you’ve arrived here from Social Media, you may be looking for our insanely simple way to make $3… by submitting an InstaReview. If that’s the case, head on over to InstaReviews. If you are looking for our more general Write for Us guidelines for posts, just jump right back on over there 👉🏻Write for Us. We created this page to make things simple for all of you beautiful, book reviewing maniacs. But we do want you to read the full details on our Submission Guidelines before submitting your book review. If your book review submission is accepted and published, your next book is on us! Be sure to include your PayPal email address. Download the PDF for ease of reference and read on. You can also Pin this image or share it with friends! Use at least 3 sections. Bullet points and lists are helpful on readers’ eyes. Still not sure where to start? Go with the basics! Did you enjoy the book? What surprised you? What’s one thing you learned that you won’t forget? Write an introduction, 2+ paragraphs of summary content, and end with a conclusion full of your spicy opinions. Take a look at these 3 examples here, here, and here to get your juices flowing. Indicated your name, email address, and a short personal bio of 3-5 sentences. You are encouraged to indicate your website’s link, as well as your social media profiles (optional). The email you have provided us is your PayPal email address. 👉🏻If you’ve done all of these, you’re ready to submit! Use the button below for Book Reviews.